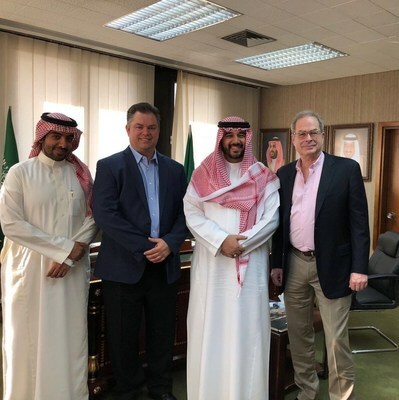 LOS ANGELES and RIYADH, Saudi Arabia, May 23, 2018 /PRNewswire/ — The Arab Esport Federation (AEF) and Global Esport Resources (GER) today announced their partnership agreement signed April 19, 2018. The twenty-five year exclusive agreement calls for GER, a global Esport strategy, planning and execution company, to own, develop and operate on behalf of and in conjunction with AEF, a first ever all-inclusive Esport gaming portal to aggregate and manage the Esport and video gaming activities of the 11 member AEF countries. The treaty, structured after the Arab Olympic League, creating the Arab Esport Federation consisting of Algeria, Bahrain, Egypt, Jordan, Lebanon, Morocco, Oman, Saudi Arabia, Libya, Tunisia, and United Arab Emirates was signed in June of 2017. Headquartered in Riyadh, AEF is creating a platform to enhance the development of video gaming and Esports in the Arab region and establishing a unified vision and strategy for youth with a global perspective. One of the key objectives of the AEF is to establish regional championships among the Arab youth and to encourage them to participate in international tournaments. HRH Prince Faisal bin Bandar bin Sultan Al Saud of Saudi Arabia is the President of AEF, Mr. Turki Al Fozan of Saudi Arabia is CEO, Mr. Ahmed Al Shaikh of Tunisia is Vice President and Mr. Ahmed Al-Taher from UAE is the Secretary-General. Riyadh is the headquarters city for the AEF. “We are very excited to be partnering with GER in this public/private effort to create the first ever single source HUB for all things associated with Esports and video gaming. As Esports moves toward becoming an Olympic sport there is a need for a coming together of the industry with collaboration among countries, to agree to clear rules, rights and duties practiced by organizations, players and publishing companies. With the creation of the HUB we have begun within our Federation to speak with one culturally sensitive voice while creating a vigorous platform for local, regional and international competitions and social interaction. The power of this combined effort gives our youth access to unparalleled opportunities otherwise inaccessible to a single country or individual,” said Federation President HRH Prince Faisal bin Bandar bin Sultan Al Saud. The exclusive agreement calls for GER to own, build and operate an all-inclusive digital HUB for all things related to gaming and Esports within the AEF countries. This includes handling all AFE local, national and cross country tournaments, team activities, merchandising, sponsorships, and streaming and media rights. AEF and GER will collaborate to aggregate users within the HUB from all member countries in order to provide a combined audience for gaming development and competitive platforms, chat rooms, training and exclusive product access. The HUB will be the exclusive revenue producing entity for AEF and its member countries. Operations are expected to commence within 60 days. Created in 2017 to emulate the Arab Olympic Federation, the Arab Esport Federation consists of the countries of Algeria, Bahrain, Egypt, Jordan, Lebanon, Morocco, Oman, Saudi Arabia, Libya, Tunisia, and United Arab Emirates. AEF is creating a platform to enhance the development of video gaming and Esports in the Arab region and establishing a unified vision and strategy for youth with a global perspective. HRH Prince Faisal bin Bandar bin Sultan Al Saud of Saudi Arabia is the President of AEF, Mr. Turki Al Fozan of Saudi Arabia is CEO, Mr. Ahmed Al Shaikh of Tunisia is Vice President and Mr. Ahmed Al-Taher from UAE is the Secretary-General. Riyadh is the headquarters city for the AEF. GER provides global Esport strategy, planning and execution. Founded to service the needs of the burgeoning worldwide Esport industry the Company is built on the experience and expertise of its principals. Its team has broad experience in consumer product and entertainment industries, specific Esport industry knowledge and extensive international experience.